You may have heard that you need to sear meat in order to seal in the juices. Sadly, that’s a barbecue myth we need to bust. Searing meat doesn’t create an impermeable barrier that prevents the release of natural juices when cooking or slicing a steak or other cut of meat. But that doesn’t mean you should abandon searing all together. intoxicating smell of roasting meat hits your nose. In short, the sear is why food looks appetizing in person and on Instagram. To start, remove steak from refrigerator at least 30 minutes before grilling. Remove excess moisture from the surface of the meat by patting it dry with a paper towel. Apply a drizzle of olive oil to steak and liberally season the meat with a rub of choice. 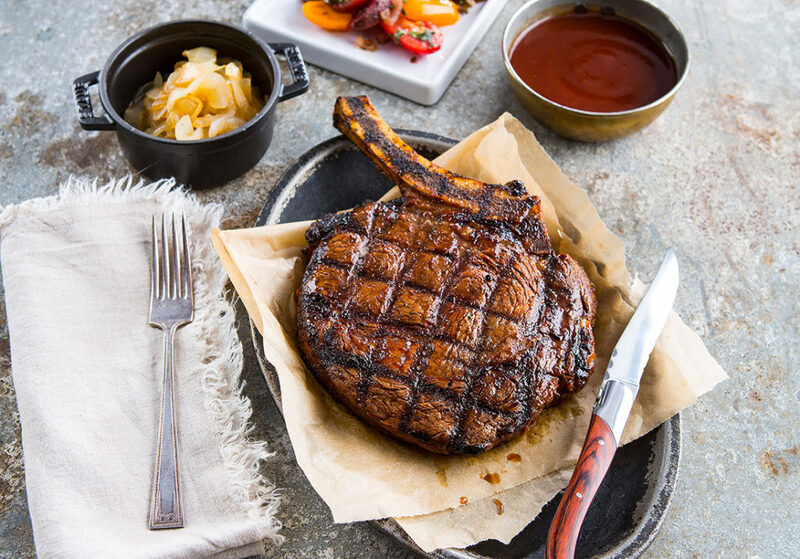 With a ribeye or strip steak, give American Royal Beef Rub™ a try for a flavor boost of black pepper, garlic, salt, and other bold spices. entirely over the hot side until a good crust forms. The steaks will be about medium rare. Cooking indoors? Use a sizzling hot iron skillet or pan with a thick base over high heat in a well-ventilated kitchen. Lightly coat the pan with vegetable oil. Place the well-seasoned steak into the hot skillet. Cook until a noticeable brown crust forms. The time will vary depending on the meat’s thickness. At this stage, restaurant chefs typically flip the steak in the skillet and finish cooking it by placing the skillet in a hot oven. At home, simply flip the steak and continue cooking for approximately 1-2 minutes to desired doneness. Use an instant-read thermometer to gauge temperature.